The morning after the previous New Zealand image I stepped out of our campervan to investigate the weather while @shepherdmanswife was pottering around inside. To her surprise I flung the door back open with a shout that she should bring her camera outside withput delay! 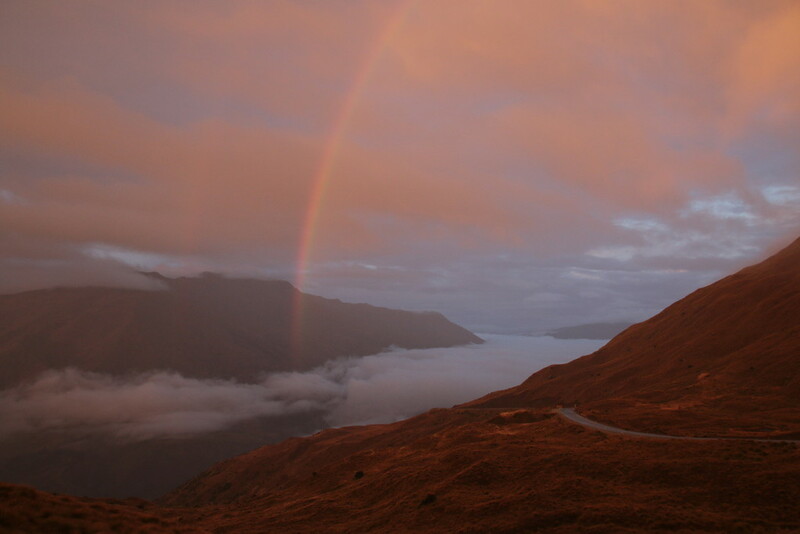 It was a magical sunrise over a valley filled with cloud, a rainbow adding to the amazing morning view. The day continued to be full of drama. @shepherdmanswife wanted to photograph bungee jumpers in Queenstown. I have no idea what came over me. I felt a spontaneous and totally insane urge. I bungee jumped. Stunning view ... you really did loose your mind .. which one did you do ... the bridge or the Nevis .. My two daughters did it several years ago .. one got a dunking .. as an added bonus...I get shaky knees just standing on the bridge..
Beautiful scene, very nicely captured. @julzmaioro Bridge. Isnt the Nevis the seriously silly high one?? Stunning view and sunrise ! Brave to dare the jump !! Fabulous image and congratulations on the jump! When I was in Queenstown a few years ago my friend did the jump! I thought she was mad! I took the photos! Fav! Beautiful image it would convince me to bungy jump though! Beautiful image. Must have been amazing in person. I wish I could press the fav button more than once. This is absolutely stunning and must have been a perfect moment that you'll remember forever. Oh man! what a view! This is superb and must have been breathtaking in person.